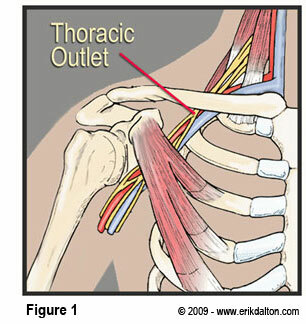 For most of you, this will be the first you’ve heard of Thoracic Outlet Syndrome. However, if you’re an athlete then there is a very good chance that this happy little guy has either affected you or one of your training partners at some point. When I was working full time as an RMT, so many of my clients presented symptoms of Thoracic Outlet Syndrome that testing for it became part of my standard new-client assessment, especially with athletes and anybody with a desk job. Basically it refers to anything that causes pain, numbness and immobility in the chest, shoulders, back and arms by putting pressure on the brachial plexus – a cluster of nerves between the clavicle and first rib. In most cases it’s caused by a muscular imbalance. When the shoulders are constantly rolled forward, the upper back and rear delts can become stretched out and weak while the pecs and front delts become tight and swollen. Poor posture and unbalanced exercise routines are the two most common culprits. If you experience pain or numbness in your chest, shoulders or arms – especially if the pain seems to start up close to the neck and refer down the arm, you are likely suffering from some form of TOS. The good news is that in the majority of cases, TOS is pretty simple to treat. Not necessarily easy, but simple. The main priority is to deal with the muscular imbalance. If time and money allow, regular trips to some form of manual therapist will be your first and best move. A good RMT or ART will be able to palpate and identify which muscles are presenting the worst of the symptoms, then address them directly. Find one you trust, book 4-6 appointments and make them a priority. Get in the habit of staying properly hydrated, especially on days when you’re going to have treatments as this will have a significant effect on the inflammation and the effectiveness of the work. 1. Hold a band in front of you with your hands about shoulder-width apart. 2. Keeping your forearms parallel with one another, move your elbows apart to stretch the band. 3. Pause when the band touches your chest, and then bring your hands back out in front until your elbows are just barely not locked out. That’s about it. This isn’t something you’re going to do with heavy resistance. It works best when you choose a band tension that you can handle for 3-4 sets of 12-15 repetitions. If you look up this exercise on the internet, you’ll find many examples of people continuing to stretch the band until their arms are straight out to the sides. This involves the triceps more than I would prefer, at least for our purposes but either one will do the job. Seriously though, do them. Even if you’re perfectly balanced and healthy they make a great addition to any routine.